News - Wu-Tang Clan's next album last one? Wu-Tang Clan's next album last one? The 44-year-old said the album A Better Tomorrow, which he is working on now, had made him consider his priorities. He explained: "When you're a young man, you're hustling and you've got 12 hours a day to dedicate to music. It might be more than that. The energy that's important is constantly pouring out. But when you've got to go seek for the energy, it becomes a little more difficult. "Wu-Tang is forever, I'll never take back that statement. But we haven't recorded a lot of studio albums. This is the first album we've recorded in seven years, actually. And we can't wait seven years for another album." RZA said he was just waiting for the final rapper's contribution, Raekwon: "Everybody did their verses except Raekwon. He hasn't turned in his verses yet. I don't know if he's still trying to find the vibe of the music. We have to talk about it before it becomes too late. But he hasn't come to the table yet." The group leader said he wasn't sure whether the album would ever go ahead without Raekwon if he didn't turn in his work: "Well, you know what, that's something that I would take a vote on with the rest of the crew. I'm not a dictator about that. 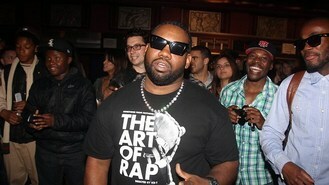 Raekwon is a valuable energy to the Wu-Tang, his voice, his lyrics, his approach. Rae is a master lyricist." RZA currently has an acting role in TV crime drama Gang Related and said he was happy to turn further towards acting than music in the future. "I live in a capitalist country so I respect, 'Cash rules.' That might get me on the mic at 50. But I prefer not to be on the mic at 50," he said.